I noticed a lot of velvet trend in the fall 2010 collections, which I am loving. I will love to get my hands on a velvet crop pants & shorts. I spent my Saturday at a V10 Lounge--a valentine event hosted by the singles ;) It was really nice event, great food, and great people all around. 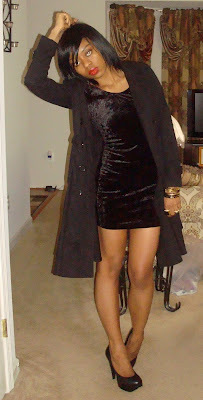 I decided to brave the freezing cold weather without tights-the price of looking good huh LOL! I hope everyone had a lovely valentine and weekend with loved ones. I have to go back to my assignment...enjoy! cute dress those shoes too clean gal! too cute! love that dress. the whole look is awesome! Ah ah??? That dress is a killer black-one....Top notch!!! I love da whole outfit! The dress is gorgeous...and it looks so themed with the background of the pic. Legs for days!! U look Haute!!! Those shoes are amazing. To die for.